This is the 3rd edition of Vegetarian Nosh for Students. This new edition has all new photography and includes fresh new recipes. Originally a sequel to a book inspired by the author's son, Ben, leaving for university, who was clueless in the kitchen. Toasted sandwiches and Mars Bars were his staple diet, but these didn't serve him too well! What was needed to encourage him to cook was an easily attainable taste of home, oh, and pictures with every recipe! 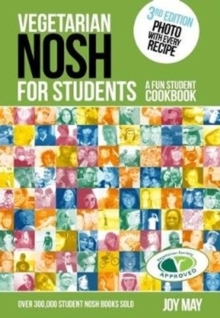 Nosh for Students was born. Since then, Joy has helped over 250,000 students get cooking with her straightforward and simple approach. Joy helps to take the chore out of cooking, giving students a taste of success and making the experience so much fun. Voted Best Overall Winner of vegetarian student cookbooks by student-testers at The Vegetarian Society.